Solomon Success > Blog > The Robosigning Settlement: Did the Just Prevail? Among the virtues praised by King Solomon in his Proverbs is justice, and many of his pronouncements refer to the downfall of the wicked; “That which the wicked feareth shall come upon him; to the just their desire shall be given.” (Proverbs 10:24). For victims of the “robosigning” scandal of 2008-2011, which saw numerous fraudulent foreclosures illegally processed by high profile lenders including Wells Fargo, Citi, JP Morgan Chase, Ally, and Bank of America, justice of sorts came in February 2012, when a $25 billion settlement was reached. How has the aftermath of the robosigning scandal really affected the housing market in general – and investors in particular? At the height of the mortgage collapse that saw massive cycles of foreclosures as struggling homeowners found themselves unable to pay ballooning mortgage payments, banks were processing foreclosure cases at an astonishing rate. Many of these went to the courts in assembly line fashion – rubber stamped by bank officials who never required or read supporting documentation and other records related to the case. 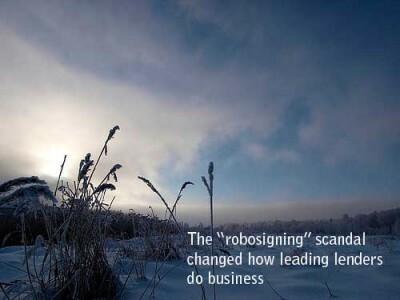 The robosigning scandal isn’t new. There have been reports of this kind of fraudulent loan processing as far back as the 1990s. But the “foreclosure madness” that began in 2008 kicked the practice into high gear and produced its own hero – whistleblower Lynn Szymoniak, an attorney who tracked her own case through the process and uncovered multiple signatures of the same individual’s name in documents fraudulently placing her home in the foreclosure pipeline. Szymoniak won an $18 million settlement and the banks settled for a total of $25 billion. But although the settlement was intended to compensate homeowners who either lost their homes outright or were put at risk for losing it in a foreclosure action fraudulently initiated by one of these banks, it may not have actually helped. The settlement provided for a possible cash payment of $1000 to $2000, or other kinds of assistance such as principal reduction, short sale approval or refinancing. Now, according to a recent report by MSN, some homeowners who received the cash payment are still faced with losing their homes or needing other kinds of assistance. Given today’s real estate costs, the settlement amount does little to offset mortgage payments or other costs. Many homeowners are finding the short sale assistance and waivers to be of more practical help. The consequences of the robosigning settlement for the housing market as a whole, and for investors in particular at the end of 2012, primarily involves activity in the housing markets as a result. Because many affected homeowners are still struggling, some are taking advantage of the expanded hardship guidelines allowing an owner to request approval from the lender for a short sale. Some properties have been legitimately foreclosed and put up for sale, offering more opportunities for investors to secure viable properties. Potentially more far reaching are the reformations of lending practices that accompany the settlement. Standards were put in place for the first time that prevented mortgage servicers from engaging in fraudulent or negligent practices and require lenders to comply with all federal and state regulations applicable to the mortgage process – an outcome that benefits not just homeowners, but also investors seeking financing for income properties. The housing market hasn’t collapsed as a result of this settlement, as some predicted. But with improved standards for processing both mortgages and foreclosures, the decision puts new safeguards in place to protect both homeowners and investors following Jason Hartman’s recommendations for building wealth through income property. In King Solomon’s terms, the just may have prevailed over the wicked.